Please read on even if you don’t have stairs where you live. What you learn could help a friend or loved one retain their mobility, even their life, for years or decades. There are millions of seniors with diagnosed mobility impairments that go up or down home stairways several times a day. You probably know some of them yourself. Why aren’t stair lifts more widely used? Some of the seniors that need a stair lift live on fixed incomes, and believe that a stair lift is one of the many luxury items they must live without. Other seniors may be unaware (or unwilling to acknowledge) that gradual declines in their vision, strength, and sense of balance, have placed them just one stairway misstep away from a life-changing injury. Both of these attitudes add to the mounting cost of healthcare in our country, but more importantly, they deprive too many seniors of years of independent living they might otherwise have enjoyed. Medicare does not yet cover the cost of stair lifts, but there are ways that stair lift ownership costs can be substantially reduced, or even eliminated. We’ll discuss some of those cost management approaches below. Seniors are not the only users of stair lifts. 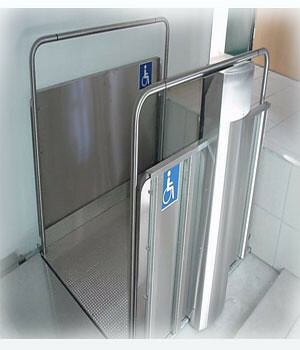 Younger people with permanent or temporary disabling conditions that make stairway navigation hazardous represent a surprisingly large pool of stair lift candidates. According to CDC statistics, young folks between 20 and 24 actually have a higher rate of fall injuries requiring treatment than do seniors. Perhaps in response to the polio epidemic of the early 1900s, the first documented electric powered "chair lift" was produced in 1923. An interesting historical note suggests that Britain’s King Henry III, known for both his engineering skills and his sometimes immoderate lifestyle – designed a servant powered "chairthrone" to help him up the long stairway to his Whitehall Palace in the mid 1500s. Necessity is the mother of invention they say. Henry weighed in at a reported 420 lbs in his later years. Manufacturers refer to their products using a variety of terms, including stair chair lift, chair lift for stairs, and stairlifts. Though the names all seem to mean about the same thing, real differences in the devices offered do exist. All stair lifts require some type of track to support them. Track designs for straight stairways can be mass produced and cut to length as required. 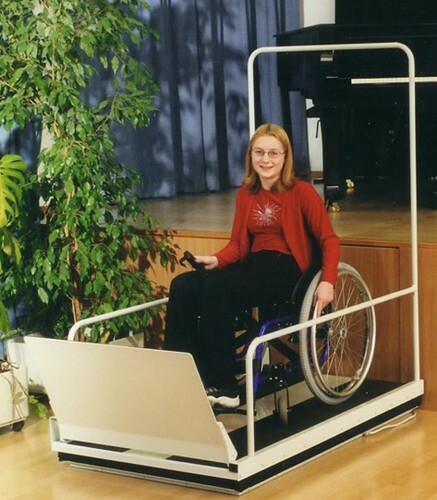 Buyers usually have the option of installing single direction chair lift models themselves. 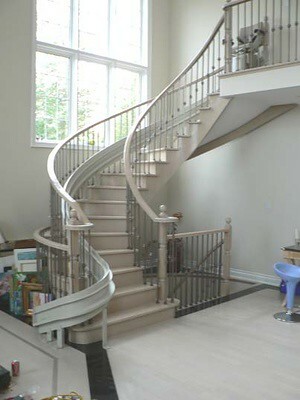 The tracks for stairways with a bend or multiple curves usually need to be custom built for each installation. They require more elaborate mounting fixtures, and are often sold on an "installed" basis only. 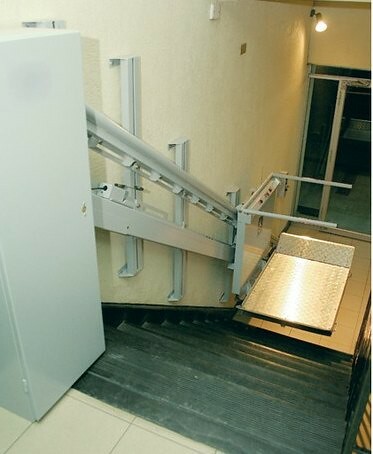 Stair lift drive systems range from inexpensive cable systems to more expensive rack and pinion and screw drive systems. Stair lift power supply options include household AC power, and battery-based DC units (which require available AC power for battery charging). Stair lift control system options also come in a variety of configurations. Call buttons at the top and bottom of the stairs may be wired or wireless. Options for the controls mounted on the chair itself include touch pads, toggle switches, and joy sticks. Other variable features include color, seat cover material, space-saving folding seats and arms, and articulated seats that make getting on and off the lift easier. To meet the strict safety standards established by product rating agencies (and to avoid costly liability claims), stair lift manufacturers must ensure that the products they sell to distributors are extremely well built. As a consequence, stair lifts are usually in excellent operating condition when their initial purchaser no longer needs them. 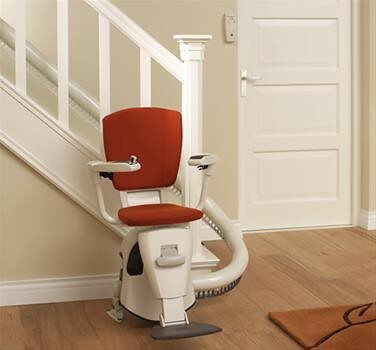 Stair lift dealers often buy used stair lifts back from the customers they sold them to at an earlier date. As a consequence, there is always a supply of good-quality refurbished stair lifts available for resale or rental. Brand new units range from around $1750 for a basic one direction model, up to the price you would expect to pay for a decent sports car for a top-end fully customized curved stairway model. Buyers who prefer to purchase a brand new unit can look forward to recouping a part of their investment through resale of the unit. A buyer that doesn’t need a brand new model can almost always get the features they want in a lower priced refurbished unit with an "as new" warranty. Most dealers also have rental programs, with units available from around $125/ month plus installation and removal charges. There are also a number of public and private entities available to help finance all or a portion of the ownership costs for a qualified buyer. When a stair lift is all that is required to allow a senior to live independently in their own home, there is a compelling public benefit to helping make that possible. Are you Interested Enough to Investigate Stair Lifts Further? If you think that you or a loved one may benefit from a chair lift, a good place to start is by getting references to help you find the area dealers with the best installation, maintenance, and ownership cost credentials. When you have selected a dealer you are comfortable with, then look at the brands and models they carry. Dealers usually carry a broad enough product line to enable them to provide a stair chair for just about any application. A good dealer will guide you through the selection process, offer you an understandable product warranty, and have skilled technicians available to install, maintain, and uninstall the product you select. If you or a loved one face the risk of navigating a household stairway on a daily basis, perhaps a stair lift is no more or less than a prudent precaution to be taken against a known risk. Anne Harvester is very knowledgable about information on how to improve the interior of a house by adding stairlifts. Anne refers to McKinley Elevator when in need of further assistance with information on how to enhance your own design. Add Anne on Google Plus.